A native to central and eastern North America. 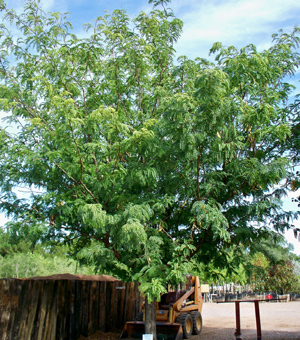 The tree has an upright trunk with spreading, arching branches. With it's small leaflets and open crown, the tree casts a light shade. This permits shade-tolerant turfgrass and partial-shade loving perennials to grow underneath. It has a very delicate and sophisticated silhouette. The leaves are alternate, pinnately or bipinnately compound, 6" to 8" long, with 20 to 30 oblong-lanceolate leaflets, 1/3" to 1 1/2" long, 3/16" to 5/8" wide. Leaves are bright green in summer turning yellow to yellow green in autumn. Produces reddish brown to brownish curved seed pods 7" to 18" long. Withstands a wide range of conditions. Tolerant of drought, wind, high pH, and saline soil conditions.